Cycling the Berlin Wall Trail (Berliner Mauerweg) is an interesting (and healthy) way to appreciate Berlin's diverse landscape, both urban and rural. It also gives you a glimpse of the wide fields of Brandenburg and hopefully could encourage you to go out into them and explore that State too. One of the pleasures of the Wall Trail is unexpectedly coming across a piece of sculpture in remembrance of the former East-West border. 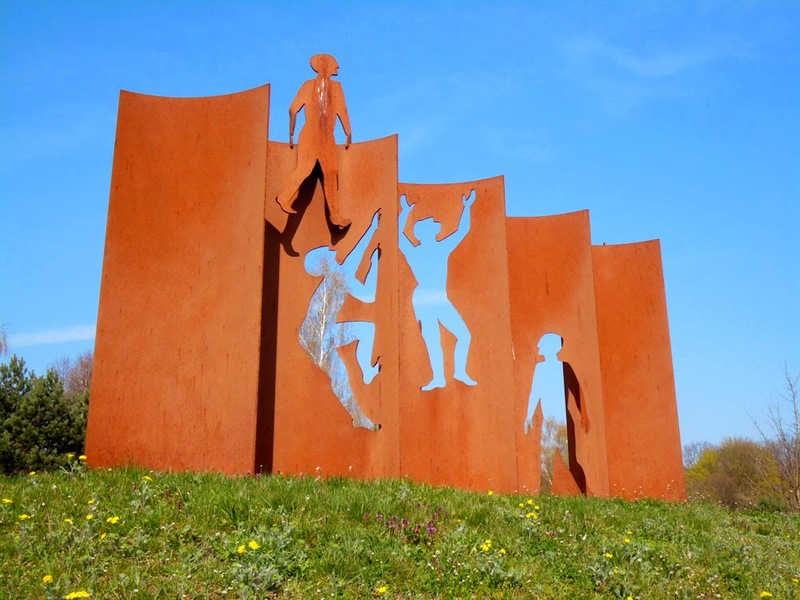 Here for example is a work by Berlin artist Kerstin Becker, located beside the busy North-South B96 road where it crosses into Berlin Lichtenrade from Mahlow in the Teltow-Fläming region of Brandenburg. This is on the southern border of Berlin and unless you caught it out of the corner of your eye as you were speeding along the B96 you probably wouldn't know about it. That is, unless you made a slight diversion from the Mauerweg like we did. When I looked into why it was located there, it raised some previously un-thought-of questions about the partition of Berlin into East and West. For example, West Berlin was for nearly thirty years completely enclosed; a tiny island in the large Communist-enemy state of East Germany. So here's the question: what do you do with your refuse? You don't want to 'spoil your own nest' when you are clinging on to only a small piece of land, but the City Council still had to deal with the practicalities of disposing of the throw-away waste of about two million people. The answer West Berlin came up with was to pay East Germany to take it away for them. This they did; East Germany desperately needed the money; West Berlin had a waste-disposal issue. And so the Mahlow border crossing was opened up in 1977 where this memorial now stands, and its traffic consisted mainly of refuse trucks carrying municipal waste and building rubble to a land-fill refuse tip at nearby Schöneiche. 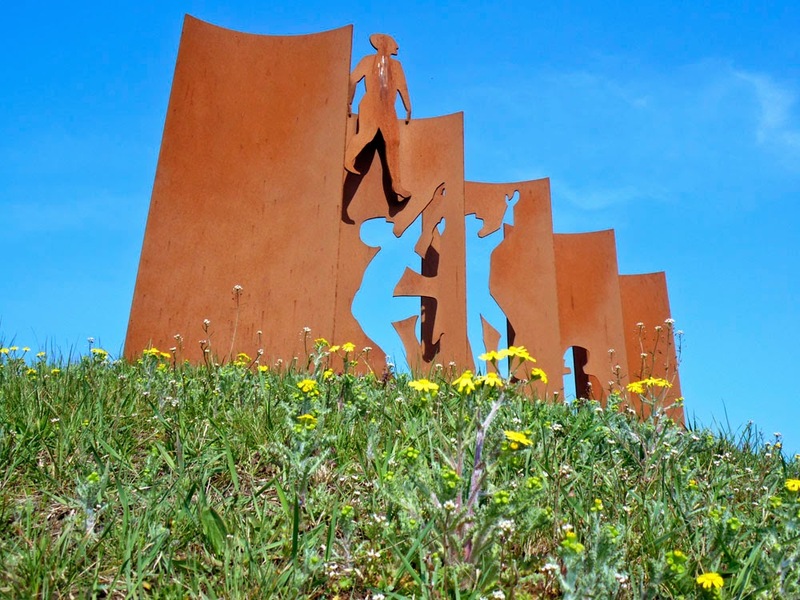 Thankfully Becker did not create a sculpture of a refuse tip, but instead a joyful depiction of figures full of hope climbing up to the wide bright-blue sky. I rather like it, and we wouldn't have known it even existed if we hadn't been cycling this way on the Berliner Mauerweg. Springtime ragwort flowering in the foreground.